I have gone to a screening of the West Side Story last night at the Vancity Theatre and yes, "I feel pretty, oh so pretty," one of its more famous songs, is on a loop in my head. Aside from being an adaptation from Romeo and Juliet and having something to do with rival gangs, I don't really know much about it at all. This 1961 film which starred Natalie Wood, is based on the very successful Broadway musical. I must admit that because this movie is not from my era, it takes a bit of time to get used to. I mean, seriously -- gang members in an arabesque and prancing around doesn't look very authentic gang warfare to me. After a while, though, I got used to the idea of a pretty boy gang member, and have appreciated its timeliness as well as many famous songs. I feel that this movie is one of those "must see" for its historical significance, besides, there are a lot of modern day spoof/reference of this movie that you just won't understand without seeing the movie. "The film has been deemed "culturally significant" by the United States Library of Congress and was selected for preservation in the National Film Registry in 1997. The film holds the distinction of being the musical film with the most Academy Award wins (10 wins), including Best Picture (three other films also won 11 Oscars each, but they are not musicals). 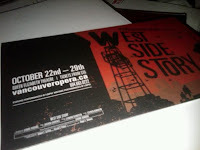 The﻿ reason that there is a screening for this is because of the upcoming adaptation by the Vancouver Opera It starts on October 22. Can't wait! I'll let you guys know how it is.